What if, once upon a time, I had taken that leap of faith? My name is Arizona Darley and my mom did just that. When Olivia decided to go back in time to find the one man she was destined to, she catapulted Arizona’s life into rollercoaster of confusion. 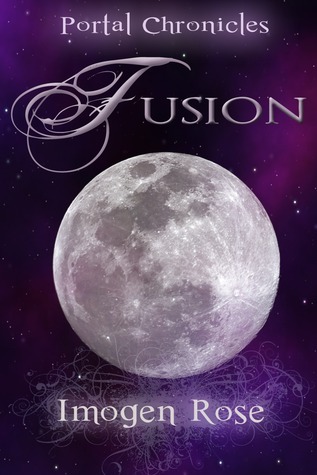 Fusion is the highly anticipated conclusion to the Portal Chronicles, which began with the YA bestseller, Portal. It’s been a few months since I interviewed the charming, but intimidating Jagger Deveraux. I was hoping to interview Arizona, Kellan, or David, but they are next to impossible to pin down. Not that it was particularly easy to arrange a time with Jagger, but I have his number and my whining capacity is legendary, known to bring the most unyielding paranormal to his knees, though it has absolutely no effect on girls, including my own daughter. Anyhow, it’s now three in the afternoon, so he’s late. Hmm. Not happy. Oh, wait! I feel a cool breeze! Jagger: “Hey! Sorry, I’m late! Got held up by Rupert. And I have to go back. I’ve only got time for a few questions.” He combs his silver-tipped hair back with his fingers and throws me one of his roguish grins. Moi: “No worries.” Pffft! I wave him to a chair. “How did you get here?” It’s not like he hangs around in Princeton. Jagger: His face darkens, and he stands up. He comes over and kisses my hand, and then he fades away. Imogen Rose is the author of the bestselling series, the Portal Chronicles, which has attained cult status within indie literature and become a favorite among teens and adults alike. An immunologist by profession, Dr. Rose published her first work of fiction in 2010. She now writes full time and is currently working on her second teen series, the Bonfire Chronicles. Imogen was born in Sweden and has lived in several places, counting London among her favorites. She moved to New Jersey in 2001. A self-confessed Hermès addict, Imogen freely admits to being obsessed with Kurt Cobain. She enjoys shopping, traveling, watching movies, and hanging out with her family, friends, and Chihuahua. Love your books, thanks for the giveaway. Why so many follow twitters? I have 2001 and can not add any more. Oooohhh this book sounds SO, SO GOOD!!! I’m definitely looking forward to reading this book! And the cover is so GORGEOUS!!! I totally love it!! Thank you so much for having such an awesome and generous giveaway!! The giveaway prizes are AWESOME!! I would love to actually win something as nice as this. Thank you again! !